With those words, Pope Francis dove headfirst into the 2016 presidential campaign, even while denying that he was attempting to do so. 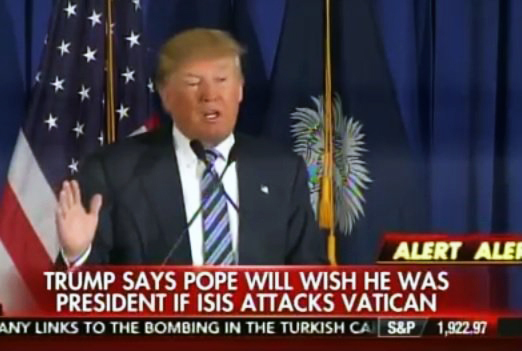 And in doing so, the Pope probably helped out Donald Trump in a monumental way. First, a few words about the wall which Donald Trump loves and the Pope despises. CNN recently performed an analysis about how to build such a wall along the 2,000-mile-long border between the United States and Mexico. CNN determined that a cinder block wall would be too labor intensive and a poured concrete wall would not be sufficiently strong. CNN concluded that pre-cast concrete panels were the best solution. Each pre-cast concrete panel would stand 20 feet above the ground and sink 5 feet below the ground, and each panel would be 10 feet wide. Panels would be connected by reinforced steel. CNN projected the total cost to be $10 billion. Trump has said that he could build it for $8 billion. The words of Pope Francis on this matter are unbiblical. Legal Immigrants For America (LIFA) will soon be publishing a book entitled “The Bible And Immigration” which examines exactly what the Bible says about immigration. For instance, the Bible cites a multitude of examples of times when Israel requested migratory permission to travel through various lands. No illegal immigration was ever involved. Respect was expected and respect was shown to various nations and their borders. The Bible also is quite clear about the importance of establishing borders and boundaries which, of course, would include walls. God even ordained borders for the Promised Land. God also warned against using compassion or emotion as excuses to justify illegal behavior or to excuse its punishment, which is precisely what Pope Francis is attempting to do, in clear violation of God’s Word. Pope Francis needs to understand the words of John Calvin and the Bible. The Pope’s personal attack against Donald Trump was politically inspired, not biblically inspired. As mentioned above, LIFA soon will be publishing a new book entitled “The Bible And Immigration.” The book will examine all that the Bible says about legal immigration, illegal immigration, examples of migration in the Bible, the responsibility of the immigrant, the responsibility of the government, and the responsibility of the Christian. LIFA will send copies of “The Bible And Immigration” to both Donald Trump and Pope Francis! Please support LIFA online today at www.GoLIFA.com so that LIFA may continue to proclaim to the nation and the world, and all of its political and religious leaders, exactly what the Bible says about immigration!